French poet Rosemonde Gérard said it so eloquently… "Car, vois-tu, chaque jour je t'aime davantage, Aujourd'hui plus qu'hier et bien moins que demain." (For, you see, each day I love you more. Today more than yesterday and less than tomorrow.) Wear your favorite love quote, name, or a significant date close to your heart on this simple smooth 14k Matte Yellow Gold band. 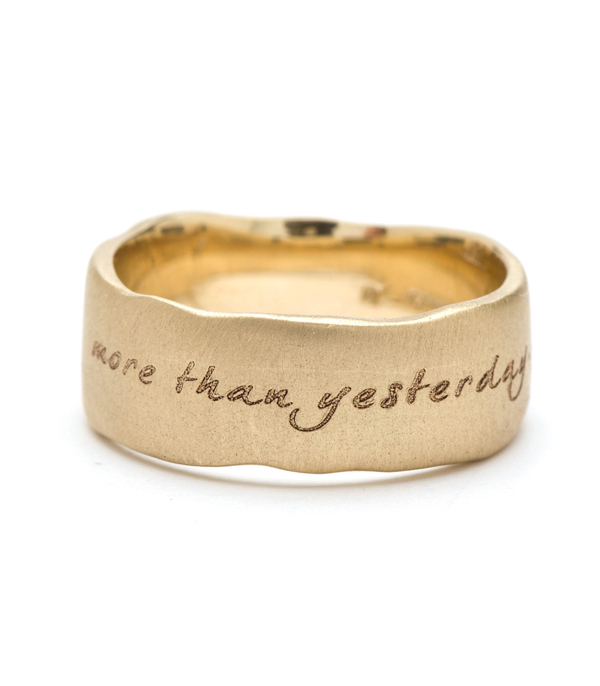 This one is engraved with, "more than yesterday…less than tomorrow…" Band approximately 7mm wide. To order this band plain or with your own verse, please call our store. Featured as Refinery 29 | "40 Awesome Wedding Bands To Fit Your Style"